More Than Bread and Butter - Michael Bader, D.M.H. 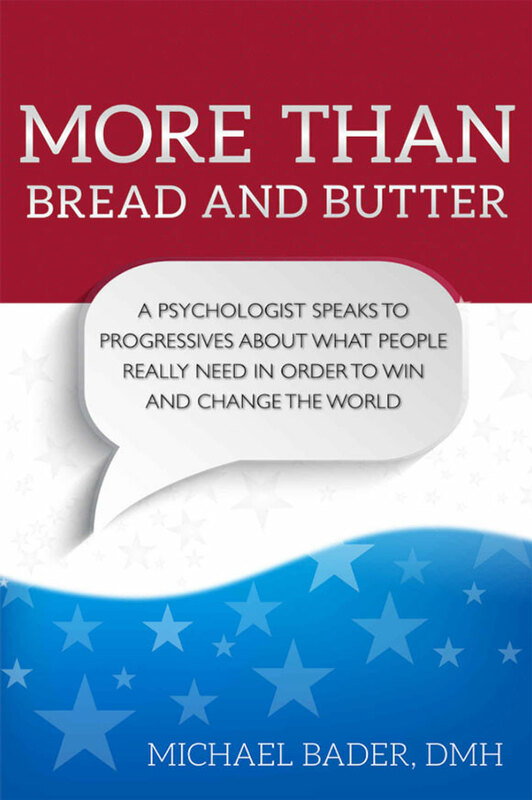 In More Than Bread and Butter, Dr. Michael Bader, a practicing psychologist, psychoanalyst, writer, and social activist for over 35 years, argues that the traditional liberal assumption that people’s need for economic security dwarfs all other needs in importance is incorrect and too narrow, neglecting as it does the centrality of other powerful human motivations such as the need for meaning and purpose, connectedness to others, recognition, and agency. The satisfaction of these non-economic needs is crucial to engaging more people and building healthier progressive organizations. Dr. Bader presents vignettes from his direct clinical work, consultations with the leadership teams of large progressive political organizations, and reviews of current research, to paint a compelling picture of the range of deep, sometimes even unconscious, motivations that make someone tick, that make up the whole person, and that are vital for progressives to more effectively address. The most successful political organizations address all of these needs and don’t limit themselves to appeals to material security and to generating outrage at the despicable disparities in income and wealth in America today. People-including voters-experience their worlds through unconscious prisms that shape what they see and what they want, and these prisms always include longings for satisfactions that are more than material in nature. Progressives, according to Bader, have to build their organizations and define their goals in ways that incorporate the true psychological complexity of what people want and need.